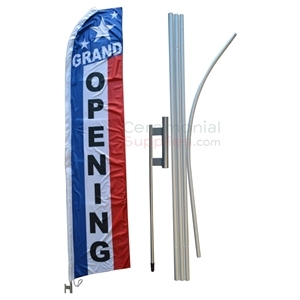 A great decoration for grand openings, groundbreakings or just any ceremonial event, these banners will add a welcome dash of color. 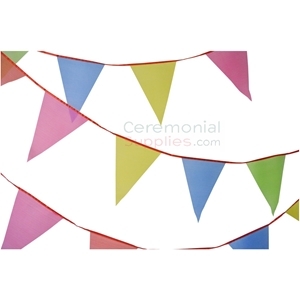 The 53 foot pennant banner comes with a festive assortment of colored triangular flags in colors such as red, pink, blue, green, and yellow. The item is largely weather resistant, thus making it a suitable item for outdoor and indoor use. 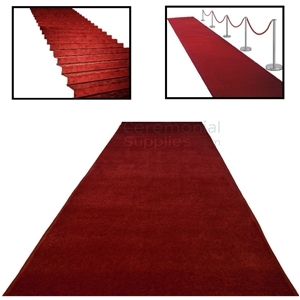 A classic red carpet for meaningful events. 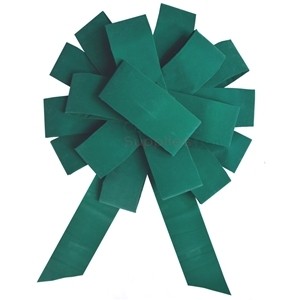 Contains 100% filament nylon for a soft plush texture. This deluxe quality ceremonial carpet is available in widths of 3-6 feet and lengths of 10-50 feet, and everything in between. 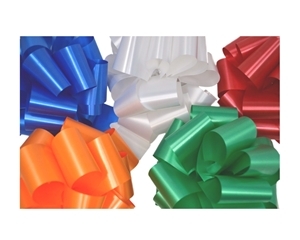 If you are interested in bigger dimensions, contact us at info@ceremonialsupplies.com or call 1-877-373-4273. Please allow 3-4 business days for processing. This deluxe grand opening banner is one of a kind. 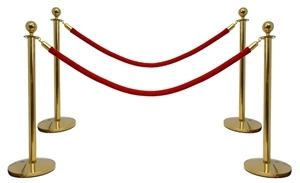 It measures 8 ft in length x 2 ft in height. 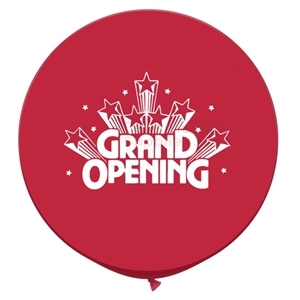 The front presents the printed Words 'Grand Opening' on a red and gold ribbon design. It is made from vinyl and has a Matte finish. 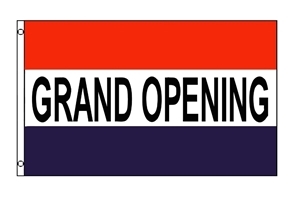 This flag kit is an excellent fit for your grand opening ceremony, with its vertical feather design that measures 11.5 feet by 2.5 feet, it features grand opening text and decorative stars with a red, white and blue color palette. The flag is made of polyester and comes with a 4 piece interlocking flag pole kit measuring 16 feet along with a 20 inch ground spike for anchoring. 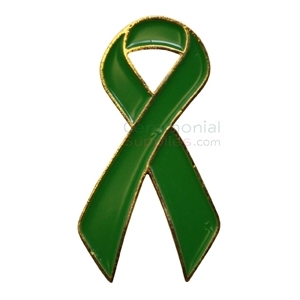 In order to raise awareness for illnesses and conditions denoted by green color, a looped ribbon is often employed. 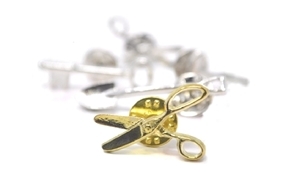 This enamel lapel pin with golden trim is a great complementary accessory. With a subtle size that measures 0.625 inches by 1.125 inches and a friction back pin clasp, this pin is a low profile yet highly visible item that is sure to be a reassuring touch. 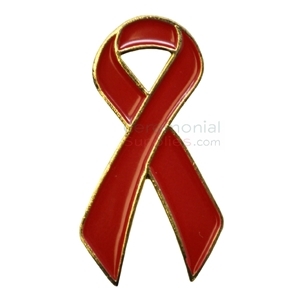 Red as a color serves as a visual representative of many causes, and with this red enamel pin with its golden trim and a convenient friction back pin clasp, you can show your support for one of these causes as well. The pin measures 0.625 inches by 1.125 inches. 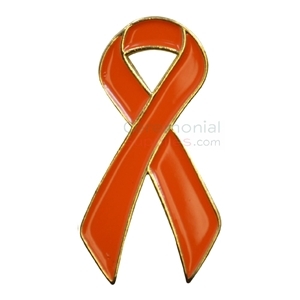 To promote awareness for illnesses and conditions denoted by the color orange, an orange looped ribbon is used, and this golden trimmed enamel lapel pin is a great substitute. With a compact size that measures 0.625 inches by 1.125 inches and a friction back pin clasp, it is a subtle and well thought out touch to show solidarity and reassure fighters. 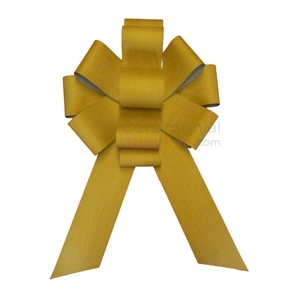 Nothing shows solidarity quite like a looped ribbon, or a lapel pin based on the design. 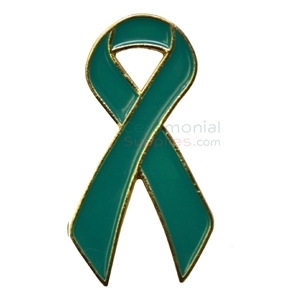 With its nifty size that measures 0.625 inches by 1.125 inches and a friction back pin clasp, the pin is a discreet and elegant way to raise awareness. 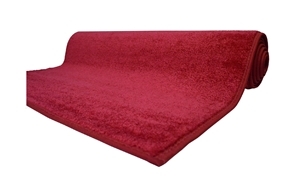 Make any grand opening, groundbreaking or red carpet ceremony a Hollywood-worthy moment with this red carpet backdrop. The backdrop is available in three different sizes: 8 X 8 feet, 8 X 10 feet and 8 X 12 feet. For a larger impact, the backdrop can be customized with the help of your company's logos. *Please be sure to provide a valid phone number and e-mail address at checkout; we will contact you after the order is placed to discuss design. Please allow 5-6 business days for processing. 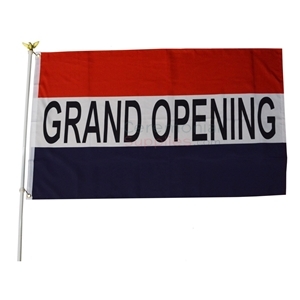 This grand opening flag set with a 3 feet by 5 feet tricolored polyester flag with header tape, metal grommets, a three piece steel pole with wall brackets and mounting screws is an ideal accessory for a making a bold statement at your grand opening ceremony. This attention grabbing carpet serves function, versatility, and looks. 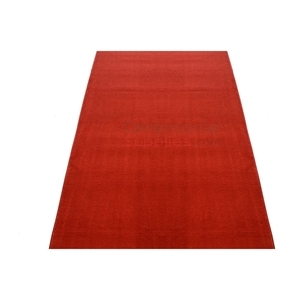 This Standard Royal Blue Event Carpet Runner is available in sizes 3’ X 10’, 3' X 15', and 3’ X 20’. Need bigger sizes? 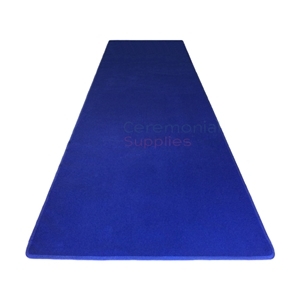 Check out our Deluxe Deep Blue Carpet, you can get it in dimensions of 3,4, or 6 feet width and lengths up to 50 feet! 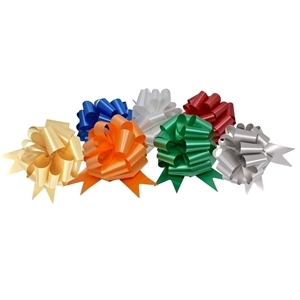 For ceremonies held for particular causes, a looped ribbon is essential. With this golden trim and teal enamel finish lapel pin, you can't go wrong. 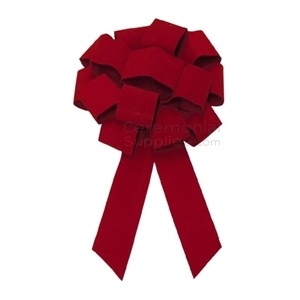 The ribbon features a friction back pin clasp, and measures a discreetly visible 0.625 inches by 1.125 inches. 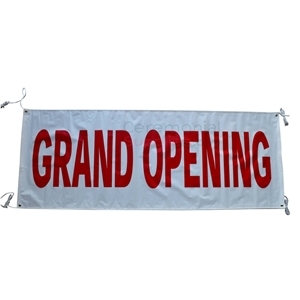 This banner is a must have for grand opening ceremonies, with convenient double sewn hems and ample 8 foot width X 3 foot height, held together by a 5 feet rope attached to the corner grommets. 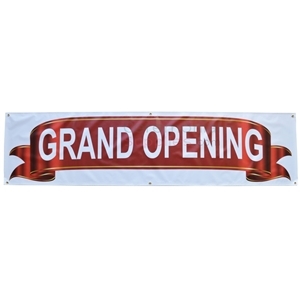 The banner features 'Grand Opening' written on it in a large red font over a bright white background. 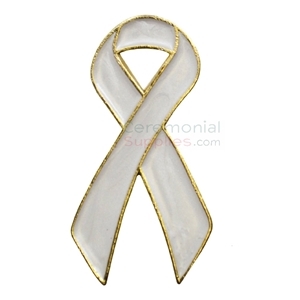 With its golden trim, this white enamel lapel pin will help you show support for special causes. It has a friction back pin clasp and a convenient size that measures 0.625 inches by 1.125 inches, this lapel pin is an excellent keepsake for any ceremony that raises awareness for specific reasons. A balloon whose form matches the grandness of your celebration. 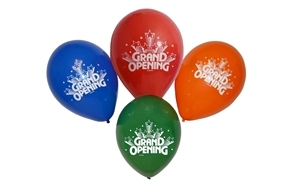 These giant red balloons inflate up to 3 feet, thus making them an attractive addition to your grand opening’s décor. They are available in red with white font. Price per each individual piece.